"This is Joyce, Selma’s daughter, writing with the very sad news of Mum’s passing last night after a short battle with pneumonia. Throughout her life, Mum had a strong personal faith in Jesus as her Saviour and Lord so she is now with Him in her eternal home. She has been a wonderful mum, grandma and great grandma and will be greatly missed. RIP. Selma was a lovely lady and I really enjoyed getting to know her as she talked and wrote about her memories of Marple as a young girl - she was very keen to have them published to a wider audience and I was very pleased to help with that. Selma also shared a good number of her local photographs for the Virtual History Tour and was very supportive of the work done by Friends of the Park. 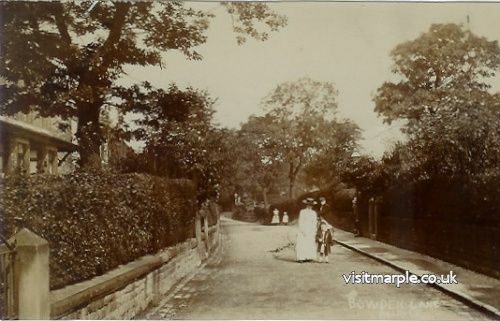 To commemorate Selma's life I have merged the two main articles she provided - her video Memories of Marple and her memories of living on Bowden Lane as a child, growing up in Marple and spending her whole life here. Rest in Peace Selma Fielding. Mark Whittaker, 23 March 2019. Selma can be heard talking to Arthur and her friend, the late Lillian Gunson, who did not want to be filmed but was happy to chip in with comments. You may also pick up the voice of Kathryn Procter, Arthur's sister. They cover a great deal of ground on all kinds of local topics and you will need around an hour to listen to the full video. Many people in Marple will know Selma, who has lived here all her life. My full name was Selma Mary Burdass, born at "Barnetby" now number 73, Bowden Lane, 88 years ago last January (2018). I went to Marple High School on Arkwright Road, now Brabyns Preparatory School, until I was 9 years old. Then on to Harrytown High School, which was a Convent but also took Protestants in those days. 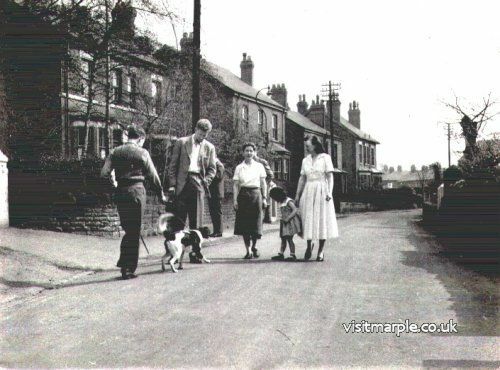 I lived at Bowden Lane until I married Frank Fielding from Hawk Green in August 1951 and we lived at 317, Windlehurst Road for nearly 40 years. My husband died suddenly in Marple Swimming Baths on Christmas Eve 1990. A few year later I found I couldn't keep up with all the gardening that he used to do and decided to move to Macnair Mews on Church Lane. I will have been here for 25 years in August (2018) and very happy too. I led a very privileged life as a child compared to many in Marple at that time. I was born at an owner occupied house “Barnetby” on Bowden Lane, now No 73, which my parents moved into a month before I was born, along with my 7.5 year old brother, from a rented house on Stockport Road near Duddys the roof repairer. 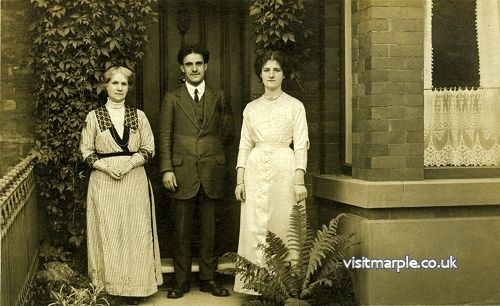 Selma's grandmother Pickstock with son Frank and daughter Eveline, Selma's mother, at 101 Stockport Road. The house was detached, the only one of fifteen houses built by Percy Woodhouse. Next to it there was a foundation laid for another detached house but because it was too near the railway embankment it was never completed. The embankment used to catch on fire with sparks from the steam trains. The station staff and my Father, when he was home, used to beat the flames out until the fire brigade arrived. Eventually my Father rented this part as extra garden, paying rent to The London North Eastern Railway Company. Railway gardeners came to cut the hedge on both sides, also digging an 18 inch trench either side near the hedge to retain the fire. The rest of the ground rent was paid to Percy Woodhouse, to pay the owners Marple Hall for the rest of the land all of the houses were built on. I believe now (2015) No 73 are having a huge extension going on the Railway Land, which I believe they have been able to buy as there are no dangers from steam trains any longer. The railway embankment was very steep, but had good blackberry bushes. My Father, being a railway employee, thought it was his right to gather them. Some children found out there was a very sandy area on the embankment and they got through the hedge where they could not be seen to play in the sand. One day the banking gave way and one of the boys was buried. The others tried to dig him out at first but eventually one boy went for help. He was dug out choking with the sand and rushed to hospital. I do not know whether he survived. Children often tried to walk on the bridge, which we could see clearly from our kitchen door. This used to worry me as I hate heights and if we had called to them they may have panicked and fallen. My Father used to go out to have a chat with them before they got on if he got chance. At the bottom of our garden was a lime pit. Lime was used for building in those days. It was a forbidden area. If it got on your skin it caused sores and it burnt holes into clothes. After a while Father bought two loads of soil to put over this area. He grew wonderful Rhubarb near there, so tall that I used to hide under the leaves or play houses with my dolls down there. Across the road there was a very large old house in lots of ground with a long driveway up to the front door. It was called the Grange, before that it was a private school, Kings School, were my Aunt and Uncle went when they were young ( Father’s sister and brother). Next to it was the Railway Bridge called King’s Bridge. When the school closed the house was then owned by a very wealthy gentleman who used to travel abroad a lot. I do not know what happened to him, but there was some furniture left in a room where you could see stuffed animals and birds from abroad in a beautiful cabinet. He had his own horse and carriage. There were stables to the right of the entrance to the house and there was an Orchard near the Stables. It was very visible from the road, children in the village used to come to steal apples and pears when they were ready. 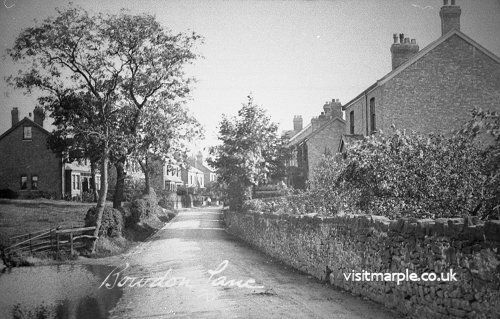 I was the only child on the Lane at that time and forbidden by my parents to go in because the building became unsafe and tramps used to go in at night. There was a Lake at the front and a smaller one at the back with a rowing boat. When I was small Bowden Lane was just a rough Lane with the occasional gas lamp and grass verge after a wide path from each house, the grass being cut mainly by the householders. When electricity was put down the Lane, my Father decided to still keep some gas lighting in case the electricity failed, as it did sometimes, especially in a thunder storm. In that case we all went into the back bedroom with the gas light. A tar macadam road was laid and most of the grass verges were reduced to widen the road and a proper pathway was made. As there wasn’t much traffic my friends used to come to the Lane to roller skate. You couldn't stand there today! When the 1939-45 war broke out a Mr Heap bought The Grange and had it with the three flats at the top half of the building, and offices at the bottom where he ran his Psychology Publishing Company, also selling the magazine. Mr and Mrs Heap lived in one of the flats. The Secretary and another clerk lived in the other two. The house name was then changed to the Psychology House. The business grew and they employed lots of local ladies as part time workers. A few worked full time. My Father retired early as his office was being transferred to Peterborough and he did not want to move house. Being a friend of Mr Heap he was offered a part time job as Stock Clerk. The old stables were used to store all the paper that came in and Father was in charge of that area. The road then became too busy to roller skate on or play hopscotch. I was older then so had other interests. Above the Psychology house were fields stretching behind. One with a path called The Seven Stiles, which eventually went through seven stiles, passing several allotment before you met Manor Hill Road, Ley Hey Park, where the path continued along Grosvenor Road to the canal and into Brabyns Park, before taking you either into the park or straight along another path another stile with a narrow path running parallel looking down on to the railway station. This was the way I often used to go to the station. Above the field on Bowden Lane were shippams for cattle belonging to Lomas’s farm, a little farther up the road on the opposite side. After the entrance to the shippams there was a pretty cottage, in extensive grounds called Bowden House. Beyond this there were more fields, one with a large slope (now Norbury Drive) causing a pond below with ducks on it. When it rained heavily it used to spread across the road and we loved paddling through it in Wellingtons. After the war an unexploded bomb was found at the top of the field. All the houses nearby including some on Station Road were evacuated from their homes while it was detonated and blown up. At the top of the Lane on both sides were large Victorian Houses with long rear gardens. Bungalows are now built after the Percy Woodhouse houses before the farm, which I think has now been sold for more houses behind it as it is not a farm anymore. The farmers cattle got Foot and Mouth Disease in the first outbreak I remember, possibly 1944? Most of them were in the Ship hams. They all had to be slaughtered. I remember a digger coming to dig a huge deep grave just above the Seven Styles Field and seeing them tipping the animals in and covering each layer with lots of Lime. There are now a pair of semi detached houses over this site. If you walked up and down the Lane past the farm you had to walk through disinfectant to stop the spread of the disease. The local field paths were all closed including the Seven Stiles and a walk past the Dale Farms. Over Kings Bridge in the lower part of the lane led to Dale Road, then Dark Lane turning left led past a couple of houses and bungalows, a large pond where there are now houses, leading to Stockport Road and Rose Hill Rail station where trains came from Manchester to go on to Macclesfield. They do not go through to Macclesfield now. On the right hand side of the road, after a little lane going off to the right, were fields then a few houses. The little lane led past a very large house in a large garden, where my Uncle was the gardener plus odd job man for Mr Porritt who lived there with his two sons. They went to boarding school because their Mother had died. We used to call it Porritt’s Lane. 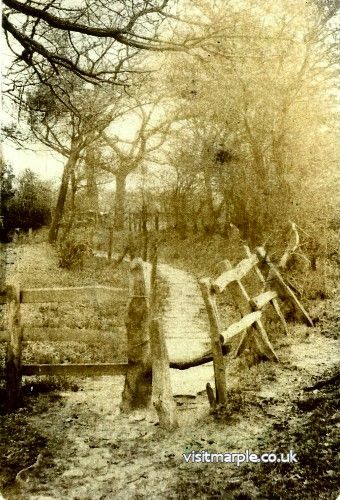 At the end of the Lane was Swindell’s farm, with a path leading off to the left through the field with a very deep pond to Flagg Wood. A path with a stile at each end and flagstones all along the path because it was such a boggy area. 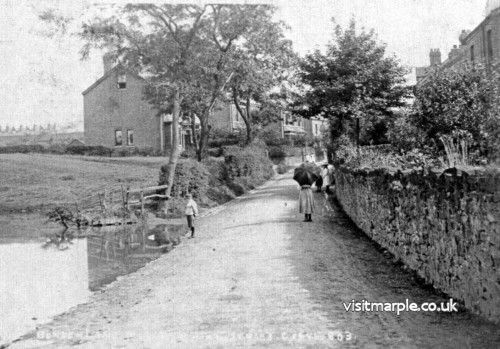 There was another pond down a lovely area with trees and primroses in the Spring, before coming to Marple Hall Drive where there was another deep pond. We use to collect frog spawn there and watch the tadpoles. All these ponds now have houses built over them. The little lane is called Kings Bridge Lane, leading to Flagg Wood Avenue. Facing the bottom of Bowden Lane was a very large house in a beautiful garden. The servant and gardener, who were then husband and wife, lived in an adjoining flat. Mrs Winder(?) was an American lady. Latterly she used to have quilting classes and exhibitions. I believe some of the garden was sold to build two more houses. 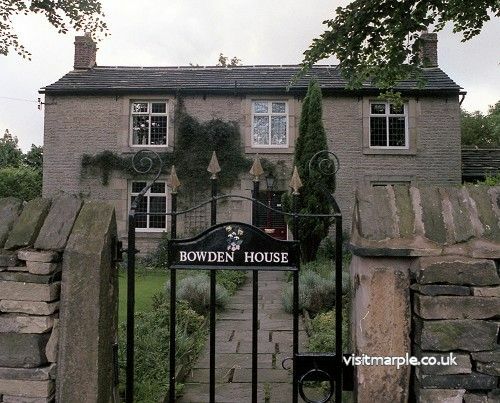 The next house as you turned right off Bowden Lane was Rose Cottage, then Pendle House, the architecture which I loved with corner windows. After this was fields, again now there are houses, then The Turnpike, more houses then Nab Top Farm. This area was then farmed by the Fielding family, distant relatives of my husband. On the right hand side after the Railway Bridge was a little gate and path leading to the entrance of some allotments on the top flat part of the railway embankment, stretching behind the bungalows. During the war and afterwards people were encouraged to use every bit of spare ground to grow fruit and vegetables because we could not import them. I think then there were three bungalows. After these was a larger bungalow in a beautiful garden, with a shop and café built on to it. Sometimes Wedding Receptions were held there. Two of my husbands sisters married the same day and their reception was held there. A cycling club used to have lunch there most Sundays after their ride. The room could also be hired out for meetings or private parties. Mr and Mrs Wincle were the owners. Mrs Wincle looked after the shop and did all the catering, sometimes employing help. Mr Wincle did all the maintenance work. Mrs Wincle's elderly Father, who had a long white beard like Father Christmas, did all the gardening. He made beautiful rockeries at the front, one with a water feature and bedding plants used to cover the other parts of the garden. These were grown and propagated in his two large greenhouses at the back of the bungalow. Some of the tomatoes sold in the shop were his too. Mrs Wincle and her Father made pies and bread to sell in the shop. Her Father loved children if they were good and a friend and I used to chat to him. One day he took us round to the back garden to look at some special plants in the greenhouse, a large one that used to eat insects and flies. We were fascinated by them. Children would not be allowed to go now without a parent. I used to feel so grown up when I was allowed to go shopping there on my own, to get shopping for my Mother and a goodie bag for myself containing sweets, or often a little note book and pencil, all for 1 penny. Further along the road were large houses on that side, one was a Nurses Home for the Nurses at The Orthopedic Hospital, an unusual architectural looking building, where children with spinal problems were treated. 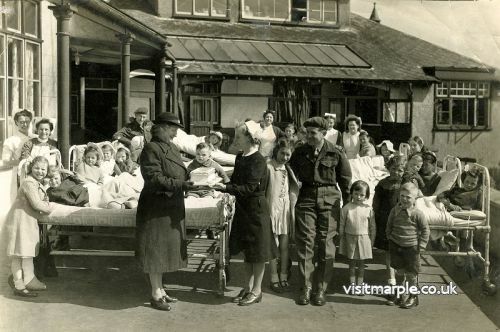 During the war the cellars of the hospital were converted into air raid shelters where the children were pushed down, some in their beds, each night. When I was a Girl Guide some of us used to go to help and play games with them, until it was “shut up” time. No health and safety rules in those days! One of the day time teachers ran a small Girl Guide Company there, Lucy Whiting was her name. It was affiliated to All Saints Girl Guide Company, which she was The Captain of. The Boy Scouts did something similar. The very large house after the hospital, I believe had a swimming pool in the garden at the top of a slope that dropped away gradually to the river. Mr and Mrs Headridge lived there with their son and daughter. They were very prominent people in Marple, being connected with The Dramatic Society, Guide and Scout Movements. After this was a large bungalow, then the road dipped sharply away. At the top there was a tree with large roots growing up out of the ground, we used to play under these and have picnics with drinks and buns from the shop. Once we found hidden treasure, a box of beads, obviously partly buried by other children. We left them there. 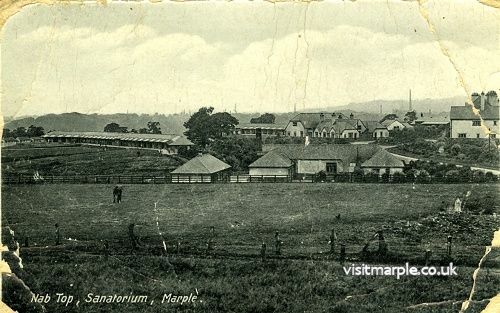 After the farm on the other side were just fields, until you came to a large hospital, The Sanatorium for people with Tuberculosis, as the air there was so pure. At the entrance was a lodge and a large house on the right where the Resident Doctor Fleming and his family lived. I was later friendly with the younger daughter who had a lovely (the first I had seen) Gold Fish pond at the bottom of the hilly front garden. When I was in the Church Youth Group, about 1946, we used to go to the hospital and sing hymns and choruses to the patients, who were in cubicles like horse boxes, sleeping in the open air to get the fresh air needed for their treatment. The hospital was built there because it was supposed to be the best air outside Manchester and Stockport. We used to take a portable organ down on rollers that was kept at my parents home. 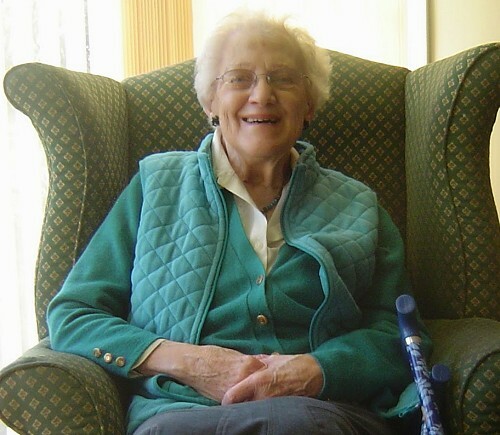 Edith Bowyer, an older member, played the organ. We were not allowed in the cubicles or to give out hymn books because of infection. It was very cold in the winter, so we were very wrapped up and felt sorry for the people sleeping in these cubicles. One of our members gave a little talk for 3 minutes which was usually well accepted. Below the hospital, for some distance down a very rocky road, were fields with cattle in one field on the left. On the right hand side was a quite flat open field where people could pitch tents and camp. It was a busy area in the Summer. The guides camped on the other side of the road each year for a week end. Meanwhile, on the flat field after that, people were stopped camping there and Manchester Canoeing club took over the area as they canoed on the river below. Farther down the road again were two more farms one with a very muddy path leading to a good path to the waterfall and weir, a pretty area, with a walk alongside the river to climb up a steep wooded area, where blue bells used to grow every year. Up at the top was a path to the left towards Marple Hall, which now goes past Marple Hall School playing fields, which are fenced off. To the right the path goes through another field to Dooley Lane and on to the Garden Centre. A very popular area for dog walkers into the wood and down The Dale.